Join us for Resurrection Sunday April 5, at the 7:45 am and 10:45 am at First Met; The Place Where You Belong! This entry was posted in First Met Event Previews and tagged easter, FirstMetChurch, resurrection. The Leaders Roundtable has been rescheduled from this Sunday to the last Sunday of this month; March 29, 2015 immediately after the 10:45 service. Our church will be in intense preparation for the Easter Season, as well as preparing to give members an update on the status and position of our church. All ministry leaders, staff, Elders, Deaconess and Deacons must be present. Please RSVP asap to Grace so we will know how much food to order. If you are unable to attend, please notify Lady O at ladyo@firstmet.org asap. If you need child care please let Grace know asap. We need the ages and names of your child/children. The meeting will be immediately after 10:45 service. Please send a representative if you are unable to attend so they can get the notes to you. 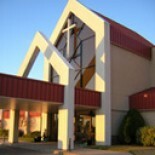 First Met; The Place Where You Belong, will have a very important church meeting Wednesday, March 25th, at 7:30 pm. All First Met members are invited to attend to hear the latest news and updates on Vision 2020 from our Pastor’s and the Vision 2020 team. There, information will be provided and answers to any questions you may have.